Arnold Palmer is generally regarded as one of the greatest players in the history of men's professional golf. Nicknamed "The King," he is one of golf's most popular stars and its most important trailblazer because he was the first star of the sport's television age, which began in the 1950s. Jack Nicklaus, also known as "The Golden Bear" was continuously ranked as the world's number one golfer on McCormack's World Golf Rankings from its inception in 1968 to 1977. 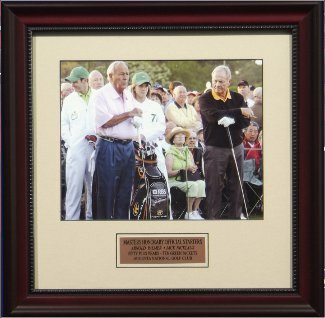 This is an Arnold Palmer and Jack Nicklaus unautographed 16x20 photo as the Official Starters at the 2010 Masters. Custom Framed and Matted. A great photo of 2 of the best golfers to ever play the game from the World Golf Hall of Fame. This product was added to our catalog on Tuesday 17 January, 2012.